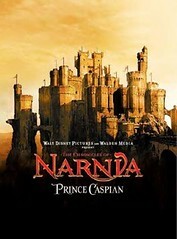 Prince Caspian is set one year after the Pevensie children stumble upon the land of Narnia in The Lion, the Witch and the Wardrobe, but it’s 1300 years later in Narnian time. In World War 2 England, the children are all coping with living in in the modern world in different ways: Lucy (Georgie Henley) is ever hopeful to return to Narnia; Edmond (Skander Keynes) still believes, yet is comfortable living back home; Susan (Anna Popplewell) is beginning to doubt, trying to move forward in England by pushing Narnia out of her head; but Peter (William Moseley) is having the hardest time, struggling to be a teenager boy again after being High King of Narnia for years. Meanwhile, Caspian (Ben Barnes) is a young prince of the Telmarines whose uncle is coveting his throne. After his aunt gives birth to a son, Caspian flees for his life and ends up in the forest where he is taken in by Narnians, thought by the Telmarines to be extinct. 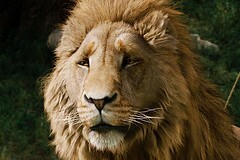 The Narnians see how Caspian can save them from the oppression they have been living under for generations, and pledge their swords and their lives to fight for Caspian’s crown. Inadvertently, Caspian is able to find a way to pull the Pevensie children back into Narnia. When the Pevensies realize that they have returned to Narnia, they meet Trumpkin, a dwarf who watched Caspian blow the horn, they set out to meet up with Caspian. On the way, they discover that Narnia is a much different place then when they left: the Narnians are in hiding, animals who could once talk have forgotten how, and the trees who used to dance, have retreated into themselves, now standing still. The children soon make it to Caspian and they all prepare to fight the Telmarines for the freedom of Narnia. 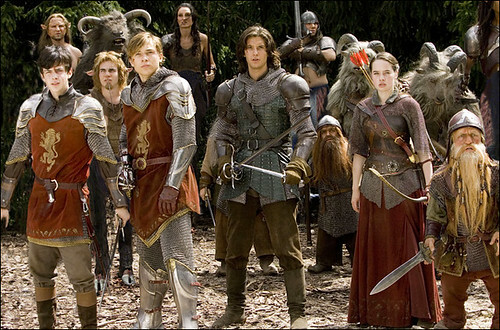 Prince Caspian is an amazing movie that everyone should see. There are a few scary parts that may frighten some of the younger kids, and while the battles in movies like The Lord of the Rings make Prince Caspian look like a tricycle sitting next to a Harley, it is more violent than The Lion, the Witch and the Wardrobe. It is well crafted, and while it doesn’t follow the book as closely as the first one, I think it is true to C.S. 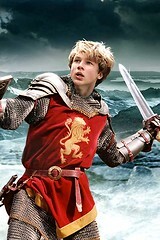 Lewis’ book and I can’t wait for the next movie, The Voyage of the Dawn Treader!